The Brothers of Elvin E. Helms No. 926 assembled in a Called Communication to confer the Entered Apprentice Degree on our new Brother Sammy Robert Meyerratken, led by Acting Master Adam Gross. Worshipful Brother and Past District Deputy Grand Master Ken Rodgers gave the Bible, Slide, and Recapitulation lectures. Worshipful Brother Adam Gross gave the Entered Apprentice Charge. We were also treated to some unexpected Masonic Education by Worshipful Brother Scott Sheldon of Beaverton No. 100 in the Grand Jurisdiction of Oregon. We had a great representation of Brothers from Elvin E. Helms No. 926 as well as other Lodges throughout the District, State, and abroad. An evening of good food, fellowship, and Degree Work was enjoyed by all in attendance. Welcome to our Lodge Brother Sammy! Pictured above, left to right: Worshipful District Deputy Grand Master, District 18, Grand Lodge of Kentucky, Dan Kemble; Mike Bryant, Pleasure Ridge Park No. 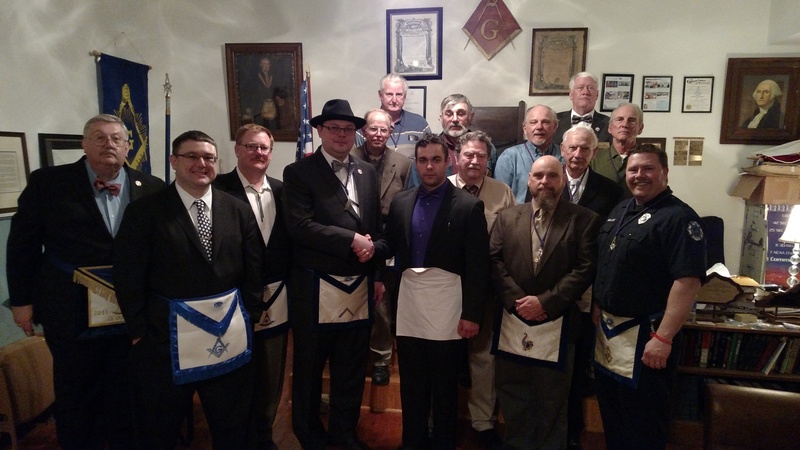 959; Worshipful Brother Scott Sheldon, Beaverton No. 100, Grand Lodge of Oregon; Worshipful Brother Adam Gross, Acting Master, Senior Steward; Worshipful Master Ernie Stratton; Worshipful Brother Jim Herzog, Senior Steward; Sammy Meyerratken, our newly obligated Entered Apprentice; Worshipful Brother Rick Campbell, Tiler; Worshipful Brother Bud Wallace, Senior Warden; Worshipful Brother Ed Tanner, Secretary; Worshipful Brother Travis Bush, Junior Steward; Worshipful Brother Mel Kinser, Chaplain; Worshipful Past District Deputy Grand Master, District 18, Grand Lodge of Kentucky, Ken Rodgers; Worshipful Brother Dennis Stephens, Junior Deacon; Worshipful Brother Jason Wallace, Junior Warden. Pictured above, left to right: Brother Mike Bryant, Pleasure Ridge Park No. 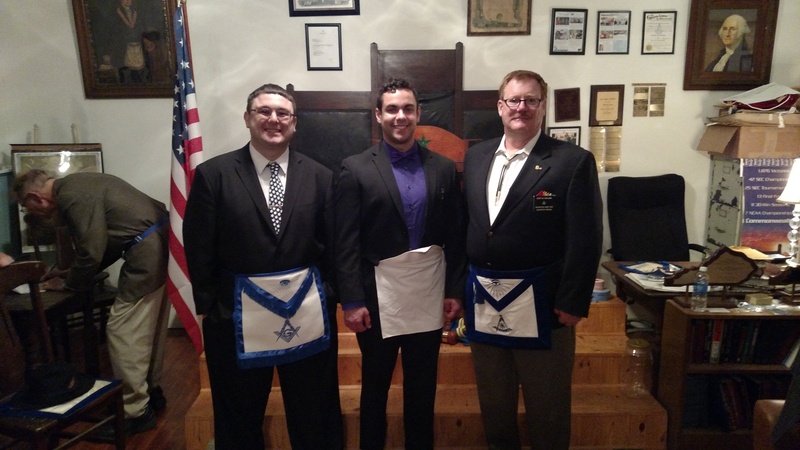 959; Sammy Meyerratken, our newly obligated Entered Apprentice; Worshipful Brother Scott Sheldon, Beaverton No. 100, Grand Lodge of Oregon. All three of these Brothers served together in the United States Military overseas. It was a very special evening for Brothers Mike and Scott to see Sammy receive his Entered Apprentice Degree. We are very thankful they made the visit to Elvin E. Helms No. 926 to share the evening with us. The Brothers of Elvin E. Helms No. 926 elected Mr. Sammy Robert Meyerratken to receive the Three Degrees of Freemasonry. Mr. Meyerratken will received the Entered Apprentice Degree on March 22, 2016 at a Called Communication for that purpose. Dinner will be served at 6:30 PM with the Degree work to follow at 7:30. We look forward to an evening of exceptional Degree work to welcome our new Brother. All Entered Apprentice Masons are welcome and encouraged to join us. At the stated communication of Elvin E. Helms Lodge No. 926 held on March 8, 2016, Worshipful Bro. Chad E. Simpson, Director of Program Development for the Grand Lodge of Ohio, delivered the Masonic Education Portion of the Meeting. Worshipful Bro. Chad was accompanied by Most Worshipful Bro. Mike Himes, Past Grand Master of Ohio. Worshipful Bro. Simpson, who is Master of the Ohio Lodge of Research and a Past Master of Arts & Sciences Lodge No. 792, Hilliard, Ohio, spoke on the placement of the pillars in King Solomon’s Temple. Worshipful Bro. Simpson told the Brothers present that the pillars and the altar were placed in such a fashion as to indicate that the true work of the Craft was to be done outside the Temple. Worshipful Bro. Chad’s education program will be posted to our site in the near future. Worshipful Bro. Simpson also induced the Brothers of Elvin E. Helms Lodge to sing, which was nothing short of miraculous and, fortunately, which could not be heard outside of the Lodge. 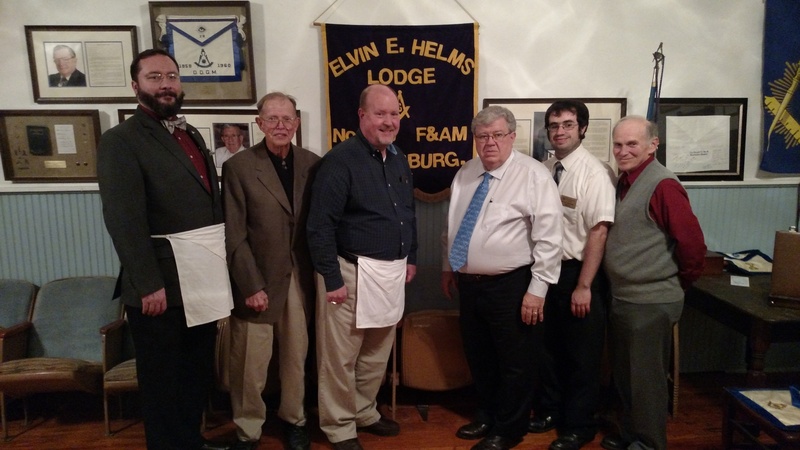 The Brothers and guests of Elvin E. Helms Lodge No. 926 enjoyed a fine time of fellowship with their Brothers from Ohio and learned much from Bro. Simpson’s program. Picture above, from left to right: Worshipful Bro. Chad Simpson, Master Ernie Stratton, David Bird, Past Most Worshipful Past Grand Master Mike Himes, Worshipful Bro. John Dettor, Worshipful Bro. Bill Dettor.